Gandhinagar: Over 4,500 Amarnath pilgrims from Gujarat including the BJP MLA from Rajula Hira Solanki are currently in Kashmir where the tension following the killing of terror organization Hizbul Mujahideen commander Burhan Wani and his two associates in an encounter with security forces on Friday has somewhat eased up. Chief Minister Anandiben Patel today convened a review meeting in this regard at her residence here in which her Chief Principal Secretary K Kailashnathan and Relief Commissioner of Gujarat Manish Bhardwaj were also present. Later Mr Bhardwaj said that a detailed list of total 4547 Amarnath piligirms who have either completed the Yatra or are yet to do so and are still in Kashmir (in and around Pahalgam and Srinagar), was presented in the meeting. It has every detail including the place of belonging, date of journey and the mode of transport etc. ‘They are all safe and the chief minister and the government machinery here is constantly in touch with the J&K authorities to ensure safeguard of the Gujarati pilgrims,’ he said adding that the situation has comparatively eased up in the valley. The relief commissioner said that he was also in constant touch with the J& K counterpart Md Afzal. The resident commissioner of Gujarat is also keeping a close eye on the situation. Earlier, state government spokesperson and health minister Nitin Patel said that ruling BJP MLA from Rajula constituency of Amreli district in Gujarat, Hirabhai Solanki, who had gone for Amarnath pilgrimage along with several people from his area, was also stranded in the valley but was safe. Gujarat Chief Minister Anandiben Patel today spoke to the Union Home Minister Rajnath Singh over phone, and urged him to ensure safety of over 4,500 Amarnath pilgrims from the state who are stranded in Jammu and Kashmir following violence there. She also held a high-level meeting of officials here with regard to the pilgrims, an official press release said. Patel sought help of the Army for bringing back the pilgrims from Pahalgam-Baaltal to Jammu. Gujarat Chief Minister Anandiben Patel contacted Union Home Minister Rajnath Singh to ensure 4,547 pilgrims from different places of Gujarat on Amarnath Yatra in Jammu & Kashmir are safe and to arrange their safe passage. Mrs. Patel convened a high-level meeting to convey the government’s concern over the safety of the pilgrims stranded at Pahalgam and Baltal on way to Amarnath due to disturbances in the Valley. She also asked the officials here to contact Principal Secretary P.K. Mishra at the Prime Minister’s Office to extend all possible help. The Security Forces have arranged the pilgrims’ stay in hotels and dharmashalas at Srinagar and Jammu comfortable. Efforts are on to get the pilgrims contact number through the Gujarat Government’s Resident Commissioner in New Delhi. Jammu: Amarnath yatra remained suspended for second consecutive day today from Jammu in the wake of the killing of a top Hizbul Mujahideen commander in an encounter with security forces in Kashmir Valley. “The yatra is suspended for the second consecutive day today from Jammu. No fresh batch of pilgrims has been sent from Jammu,” Deputy Commissioner Jammu, Simrandeep Singh, said. He, however, said the yatra from the base camps in Kashmir is on. The yatra was suspended from Jammu yesterday following violence after the killing of Burhan Wani. Mobile and Internet services also remained suspended in Jammu as a precautionary measure. 1,18,747 pilgrims have so far paid obeisance at the cave shrine in the Kashmir Himalayas. 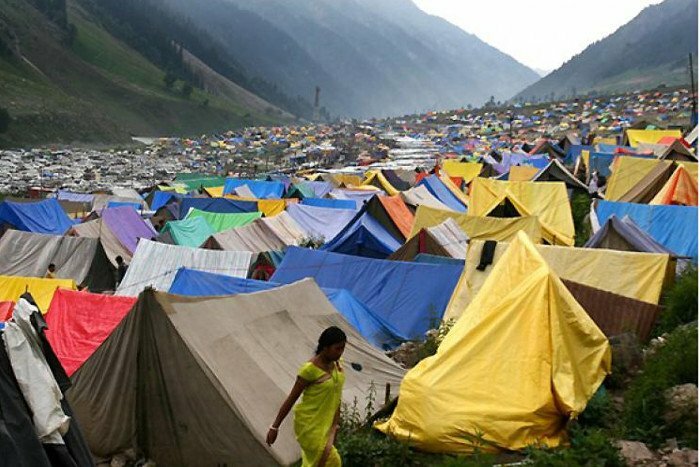 A state government release said 15,684 yatris paid obeisance at the Amarnath shrine on the 8th day of the pilgrimage. “The yatra convoy did not proceed from Jammu for the two base camps today because of law and order considerations,” it said.